Looking for 2019 Minimum Wage Information? On January 1, 2018, Oakland’s Minimum Wage goes up to $13.23. Click here to read the media release on the minimum wage increase on January 1, 2018. Measure FF, the voter-initiative ballot measure passed in November 2014, provides annual increases to Oakland’s Minimum Wage based on the Consumer Price Index (CPI-W) for urban wage earners and clerical workers for the San Francisco-Oakland-San Jose, CA Metropolitan Statistical Area. The CPI-W from August 2016 to August 2017 increased approximately 2.9%. Thus, Oakland’s Minimum Wage will go up 37¢, from $12.86 to $13.23 on January 1, 2018. • The other benefits mandated by Measure FF — paid sick leave and payment of service charges — remain the same as when the employment law took effect on March 2, 2015. To assist employers and employees to better understand the new employment law, the Office of the City Attorney has issued a memorandum that answers frequently asked questions. Like other FAQs issued by the Office of the City Attorney, this is a general guide and resource, and does not constitute legal advice. Bộ Câu hỏi Thường gặp (FAQs). Rules and regulations for the Enforcement of Oakland's Minimum Wage Law (Measure FF) issued May 2016. Click here to view the Resolution (85423 C.M.S.) enacting and approving Regulations interpreting the Oakland Minimum Wage Law adopted by Oakland City Council on February 19, 2015. Click here to view the staff report from the Office of the City Attorney that accompanied the Resolution (85423 C.M.S.). Employers must post and give written notification of these rights to each current employee and to each new employee at time of hire. In some cases, notice must be given in languages other than English. To assist with this notification, the City has created the following posters. The posters have been updated to reflect the minimum wage increase effective January 1, 2018. If you need the previous version of the notification poster, please contact Contracts & Compliance Office at (510) 238-6258 or minwageinfo@oaklandnet.com. Click here to view the letter that was sent in December 2014 to Oakland businesses in the annual business tax renewal mailing. Employers are prohibited from discharging, reducing compensation or otherwise discriminating against any person who makes a complaint under the ordinance. Click here to view a roster of Employer Tools & Resources including partner organizations that offer technical assistance and legal resources. Luật Lao Động Theo Pháp Lệnh FF Oakland: Công Cụ & Nguồn Lực Cho Nhà Tuyển Dụng. For business owners who need a referral to a service provider for additional assistance with the new employment law or general business technical assistance, please contact the City of Oakland's Business Assistance Center at www.oaklandbusinesscenter.com, (510) 238-7952 or oaklandbac@oaklandnet.com. On January 25, 2018, the City of Oakland will host a workshop on new State employment laws that take effect in 2018, including the updated Oakland minimum wage rate. The free workshop will be at the Oakland City Council Chambers, Oakland City Hall, 1 Frank Ogawa Plaza from 8:00 am to 10:00 am. Come learn about new State Employer Requirements and an update on the Oakland Minimum Wage Program. Employers can also learn about resources available to assist them. For information, contact the Oakland Business Assistance Center, (510) 238-7952 or oaklandbac@oaklandnet.com. Interpretation services will be provided in Spanish and Cantonese. Centro Legal de la Raza, 3022 International Blvd., Suite 410, Oakland, CA 94601. Individual consultations with Centro Legal attorneys on a first-come, first-served basis, so please be prompt. Limited capacity. Other workers' rights clinics are by appointment only. Call (510) 437-1554. If you believe that your employer is not paying you the voter-mandated minimum wage and providing paid sick leave, please complete an Employee Questionnaire & Declaration form and submit it to the City of Oakland's Contracts & Compliance Office. Click here to download the Employee Questionnaire & Declaration form as a PDF. Click here to download the Employee Questionnaire & Declaration form as a Word file. For additional information, please contact the City of Oakland's Contracts & Compliance Office at (510) 238-6258 or minwageinfo@oaklandnet.com. 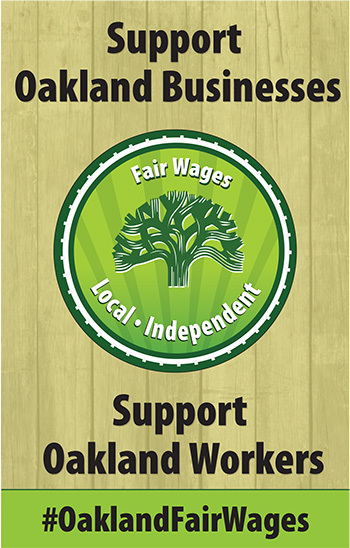 Our partners at Oakland Grown have put together posters and graphics to get the word out and encourage the community to Support Oakland Workers and Support Oakland Businesses. Consider using these materials to help the public understand the importance of supporting local businesses as the new employment law takes effect. Click here to visit the Oakland Grown website. On November 4, 2014, voters approved Oakland Measure FF which raised the minimum wage in Oakland to $12.25 on March 2, 2015. Employees who perform at least 2 hours of work in a particular workweek within Oakland - including part-time, temporary and seasonal employees - must be paid at least the minimum wage. The ordinance also adjusts the minimum wage up based on the regional Consumer Price Index (CPI). The first CPI adjustment will take effect on January 1, 2016, and ever year thereafter. The minimum wage increased to $12.86 on January 1, 2017 and will increase to $13.23 on January 1, 2018. Click here to read the City's media release issued on March 2, 2015. Measure FF also requires employers to provide paid sick leave to any employee who performs at least 2 hours of work within Oakland. Employees shall accrue 1 hour of paid sick leave for every 30 hours they work. Employers may cap accrued paid sick leave earned by an employee at 40 hours for small businesses (fewer than 10 workers) and at 72 hours for other employers. Employers may set a higher cap or no cap at all. Employees may use paid sick leave for the employee's own illness or injury, or to care for family members or other designated persons as defined by the ordinance. Measure FF also requires that hospitality employers (such as hotels, restaurants, and banquet facilities) who collect service charges from customers must pay the entirety of those charges to the hospitality workers who performed those services for which the charge was collected. The City of Oakland will be updating this page as new information becomes available. To receive email notifications when the information is updated, please click the Subscribe for Updates link above right. Click here to view information on Measure FF (including the full text of the Measure) from the Alameda County Registrar of Voters Guide. Click here to view 85300 C.M.S., the resolution declaring the results of the November 4, 2014 election. Click here to view the Minimum Wage Implementation Info Report going to the Oakland City Council's Finance & Management Committee on February 10, 2015. Click here to 85109 C.M.S., the City Council Resolution to put the petition-based Minimum Wage Ordinance on the ballot for the November 4, 2014 Statewide General Election. Click here to view a Staff Report and Supplemental Report from 2014 on creating an Ordinance amending the Oakland Municipal Code to establish a City Minimum Wage. If you have questions or need additional help, please call (510) 238-6258 or email minwageinfo@oaklandnet.com. In your message, kindly provide your name and telephone number as well as your business name and address. City staff will contact you to answer your questions and provide additional information.